Yes! I Want To Shine On Screen! 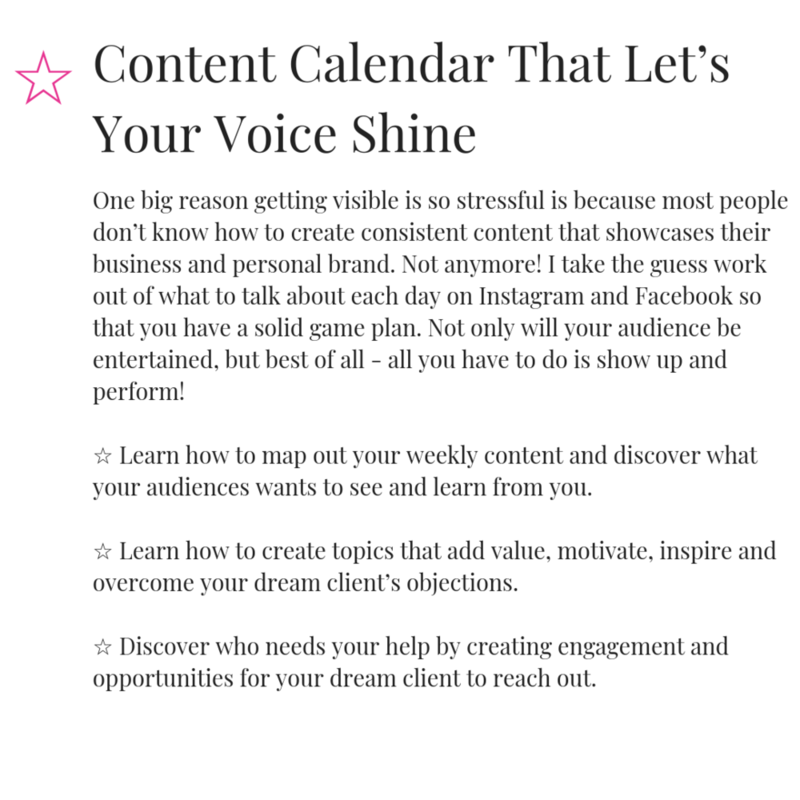 Courtney has helped me so much with getting confident on my lives and in my business, she fills my calendar with lots of content to use, when I’m running out of ideas. Since working with her I have grown my followers and group members. My close friends have seen me grow so much in the last 4 weeks. "But can't I just film A video on my own?" You can if you'd like to... but my guess is that either you've gone down that path already and seen the fruitless and frustrating results... or you're on the path to learning that now. Filming a Live Video, and having the money follow ONLY works if you have a strategy. Without a strategy for getting on Live Videos you’ll always struggle to turn viewers into clients. So, do you want to get past your fears and grow your business on Live Video?! Are you ready to finally make things easier than they’ve ever been before? Then get ready because developing a strategy for Live Videos will be the most effective asset you’ll ever have to transform your business, your life, and the lives of others. ☆ Shine On Screen takes your knowledge, information, unique personality, and time you've invested in your business and helps you to stand-out and grow your business on video! ☆ Shine On Screen involves creating a plan to help you educate, serve and entertain your viewers. This includes how to create and outline your content, what tools you'll need to make your videos stand-out, and how to generate sales and convert leads. ☆ Shine On Screen is about shifting your focus from only talking about your products and services to creating a personal brand, allowing you to create a bigger following and earn more income as a result. ☆ Shine On Screen is about becoming visible, consistently showing up, and becoming an expert for your clients. This program is designed to get you visible and consistent so you can start becoming the go-to person in your industry. ☆ Shine On Screen is NOT about being perfect on video. It’s about being the professional that you are! It’s about being authentic in your message and gift you provide to the world. ☆ Shine On Screen Is NOT about winging it on live video. Winging it is not a plan. Getting good on video is a skill you develop over time, like learning to paint or take professional photos. ☆ Shine on Screen Is NOT about learning to selling your products and services online. All that does is turn viewers off by coming across too sales driven. I already booked a 5k client just using the strategies she provided! That’s what Shine On Screen will do for you! As a bonus for signing up TODAY I will be gifting you my Time to Shine 5 Modules + Bonus worksheets. Since working with Courtney, I’ve been “live” somewhere on social media at least 4 times per week-versus NOTHING before. Each time I turn on my camera to go live, I feel more confident and relaxed than the time before and this is because Courtney has carefully mapped out my content for each week, taking the pressure off me to think of content AND go live. She also gives me the appropriate hashtags; the script; the questions to ask; the polls to use-in a nutshell-EVERYTHING you need to go live. No more excuses. Using her technique, I’ve been able to reach out to more potential clients and create conversations and relationships in an organic way.